“First new material from the band in 13 years” is quite an impressive eye-catcher to put in your promotional information, and it's certainly a pleasure to hear Justin K Broadrick and GC Green finally producing new songs. 2009's reformation seems a very long time ago, and as good as the Godflesh back catalogue is, a new album would be even better. Decline & Fall is a stopgap release before said album, A World Lit Only By Fire, is out this autumn, featuring four new songs that are immediately reminiscent of the band's signature sound; weirdly catchy looping grooves backed with clanking percussion and topped with Broadrick's half-shout. Yes, this is far from his Jesu persona, raw and aggressive; those guitar grooves sludgy and grinding. Even the industrial elements, most notable here on Playing With Fire, are sinister and oppressive, making the track's relentlessly robotic riffs and rhythms all the more disturbing. It's interesting to hear something of a melting pot when it comes to tying down exact comparisons, as there are as many shades of early, heavy and corrosive Godflesh as there are the later releases which sound like Prong having a dance-off. 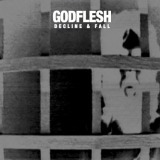 This is as danceable as later Godflesh, especially on Dogbite, but there's no denying the heaviness and nastiness of the band's early days is very much present. The title track here even has a return to growls, a reminder that JKB has his roots in grindcore, once fronting Napalm Death, and that those roots are as much a part of Godflesh as the dub and punk influences that have joined them over the years. As a forerunner for a new album this is excellent; but fans will find much to appreciate in the songs themselves, which are exclusive to this EP.